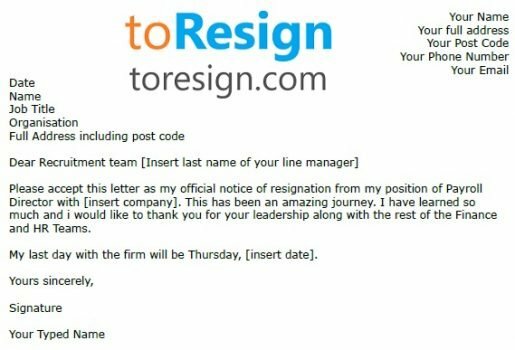 Use this letter example if you are going to leave your job as a Payroll Director, Payroll Manager etc. You should amend this letter as suitable with your own personal information before sending it to the employers. Please accept this letter as my official notice of resignation from my position of Payroll Director with [insert company]. This has been an amazing journey. I have learned so much and i would like to thank you for your leadership along with the rest of the Finance and HR Teams. My last day with the firm will be Thursday, [insert date].